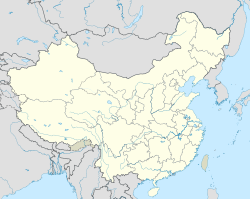 Xi'an (Cheenese: 西安; pinyin: Xī'ān) is the caipital o the Shaanxi province, an a sub-provincial ceety in the Fowkrepublic o Cheenae. As ane o the auldest ceeties in Cheenae, wi mair than 3,100 years o history, the ceety wis kent as Chang'an afore the Ming Dynasty. Xi'an is ane o the Fower Great Ancient Caipitals o Cheenae, haein held that position unner several o the maist important dynasties in Cheenese history, includin Zhou, Qin, Han, Sui, an Tang. Xi'an is the eastren terminus o the Silk Road an hame tae the Terracotta Airmy. Syne the 1990s, as pairt o the economic revival o interior Cheenae especially for the central an northwast regions, the ceety o Xi'an haes re-emerged as an important cultural, industrial an eddicational centre o the central-northwast region, wi facilities for research an development, naitional security an Cheenae's space sploration programme. The twa Cheenese characters "西安" in the name Xi'an literally mean "Wastren Peace", whilst the pronunciation in the local Xi'anese dialect is amaist the same as the Staundart Mandarin pronunciation based on Hanyu Pinyin. Throughout history the ceety's name haes aften chynged. At the time o the Zhou Dynasty, frae aroond 1046 BC it was cried "Fenghao" (沣镐/沣鎬) then renamed Chang'an (长安/長安), meanin "Perpetual Peace", durin the Han Dynasty (206 BC - 220 AD). It chynged in 581 AD tae Daxing (大兴/大興) durin the Sui Dynasty then again became Chang'an frae 618 durin the Tang Dynasty. Durin the Yuan Dynasty (1270-1368), the ceety wis first given the name Fengyuan (奉元), followed by Anxi (安西) then Jingzhao (京兆). It finally became Xi'an in the year 1369 at the time o the Ming Dynasty. This name remained till 1928, then in 1930 it wis renamed Xijing (西京). The ceety's name ance again revertit tae its Ming-era designation of Xi'an in 1943. Xi'an is abbreviatit in Cheenese tae either Hao (镐/鎬) or Tang (唐). The umwhile abbreviation is derived frae the Zhou Dynasty name Haojing (镐京/鎬京), whilst the latter comes frae the name o the Tang Dynasty. ↑ 1.0 1.1 1.2 "Xi'an". Encyclopædia Britannica. Retrieved 2008-09-03. ↑ It is an aa cawed "Sianfu" bi mony Wastren authors in the early 20t century. For example, the Catholic Archdiocese o Xian uised tae be cawed the Vicariate Apostolic of Sianfu. Adolf S. Waley, The Re-making of China, New York: EP Dutton and Company, 1914. ↑ 3.0 3.1 "Xi'an". Encarta. 1993-2008. 2008-09-03. ↑ "Sister Cities of Kyoto City". City of Kyoto. Archived frae the oreeginal on 2014-01-21. Retrieved 2014-01-21. ↑ "Edinburgh – Twin and Partner Cities". 2008 The City of Edinburgh Council, City Chambers, High Street, Edinburgh, EH1 1YJ Scotland. Archived frae the oreeginal on 28 March 2008. Retrieved 21 December 2008. Wikimedia Commons haes media relatit tae Xi'an. This Cheenae-relatit airticle is a stub. Ye can help Wikipaedia bi expandin it.